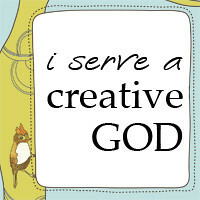 By choosing to do things that are pleasing to God, we can more fully and deeply grow in faith and creativity. I really like how this verse translates in the Message Bible. It fits perfectly in what I have been stressing all along....we can be creative/inventive! And lets do it to encourage love and to help out! I really don't think I can add anything to that! It will definitely encourage love! there sure is alotta happy being spread, isn’t there? ;) happy day to you! wow, love that verse translation. and HOORAY for the happy day project!